One of our favorite meals to make is Mexican. Tacos, burritos, enchiladas, it doesn't make a difference. I especially love it because these meals are usually quick, easy, and budget friendly. 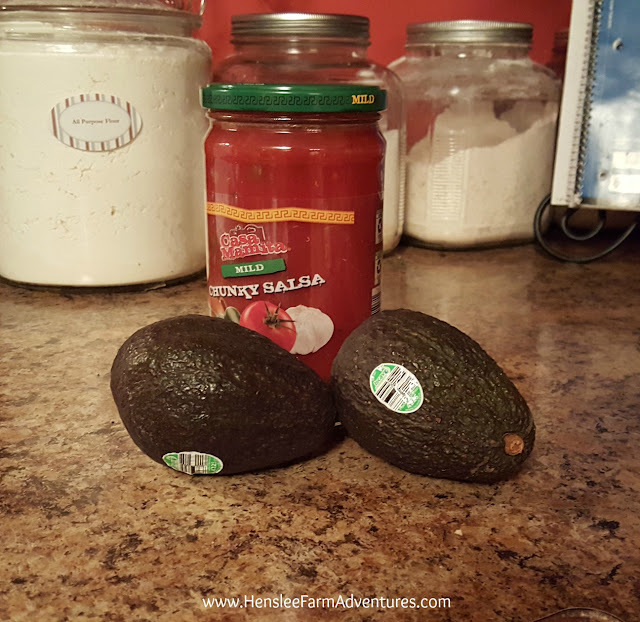 Last week I bought a couple of avocados at Aldi when they were on sale, $0.39 each! The only problem was that they were not ripe yet. In the past, I have tried to ripen them by putting them in a paper bag, but I found that it didn't work that well. I have also heard that you can put them in an oven on low heat to ripen, but that method just scares me to death! I just know I would forget about them and end up burning them. The best way I have found to ripen them, but the longest, is to just put them on your window sill until they turn dark green and slightly soft to the touch. Last night the avocados were ready to use! So of course that meant Mexican night! I had let the avocados get slightly softer than I would have if I were just slicing them and eating them on a sandwich or by themselves. I did this because I knew I wanted to make guacamole out of them. 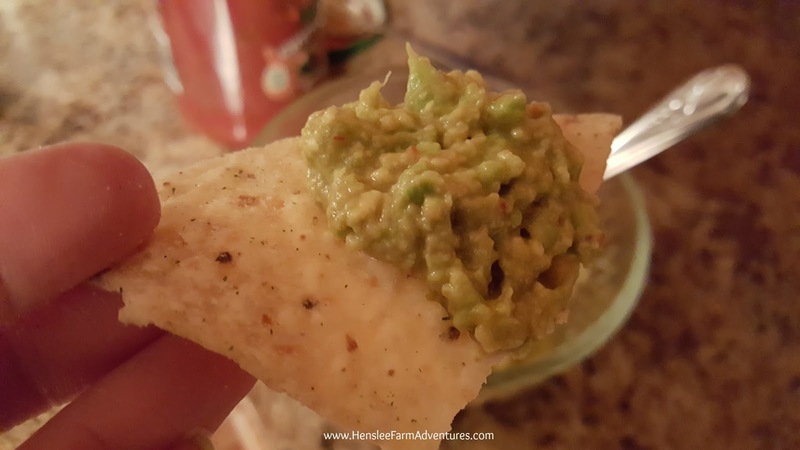 I absolutely love guacamole! My little girl loves it too. So in our house, while the boys will eat their sour cream, the girls will eat the guac. 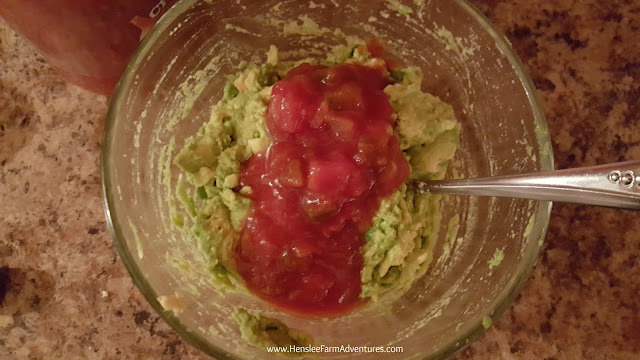 I have tried many different recipes when it comes to making guacamole. And I have to say that my niece's husband makes some of the best guacamole around! Of course he used to manage a local Mexican restaurant, so he had connections. While there are great recipes out there, I wanted to share with you how I like to make it. Not only is it yummy, but it is the easiest guacamole you will ever make. Salsa and avocados. That's it! All you need are your avocados and your favorite salsa. That's it! Normally we make our own salsa and can it, but it is a little on the hot side. So I buy this mild salsa from Aldi. It is one of my favorites because it has only natural ingredients and the kids love it! First you want to slice the avocado in half. Just take your knife and slice it in a circle long ways around the seed. 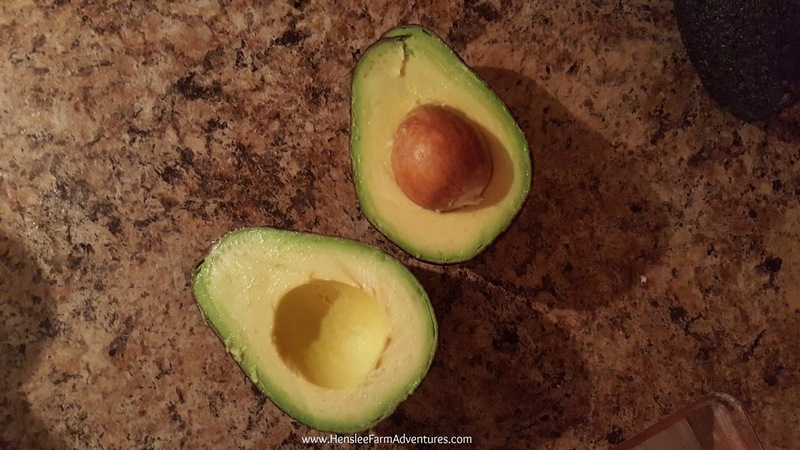 Then to open it up, twist the avocado and pull apart. Next, use a spoon and spoon out the insides from the peel. If the avocado is nice and ripe, it will come out very easy and usually in one piece. I go ahead and put this straight into a bowl (no picture, sorry) and I do use a third ingredient that I forgot to mention. I add a little lemon or lime juice just to keep it from browning. Then I mash it up with a fork. My avocados all mashed up. Next you want to add your salsa. Of course there is no exact measurement. It really depends on your taste preference. I used a serving spoon and put three spoonfuls into the bowl. It was probably equivalent to a little over 1/4 of a cup of salsa. You can see above how much salsa I added to two avocados. Then be sure and mix well and taste. At this point you can always add more salsa if you like. 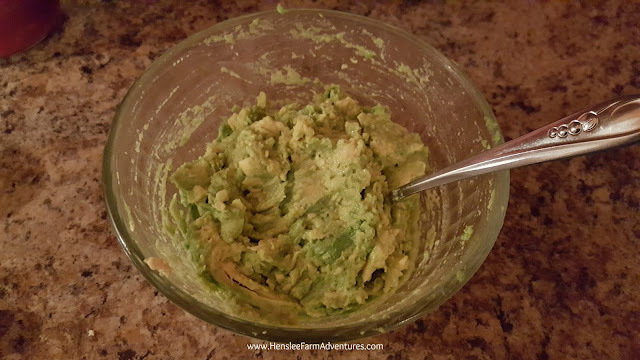 And now you have the easiest (and some tasty) guacamole! When you taste it, it may seem like you need to add a little salt. A word of caution, if you are using chips to eat it with, remember the chips can usually be pretty salty. I never salt my guacamole because of this. I don't want it too salty. Plus I really like the creamy, buttery taste of the avocados to come through. This went fast. And to be honest there was none left, but I did want to give you another hint on how to keep your guacamole from turning brown if you do have any leftover. 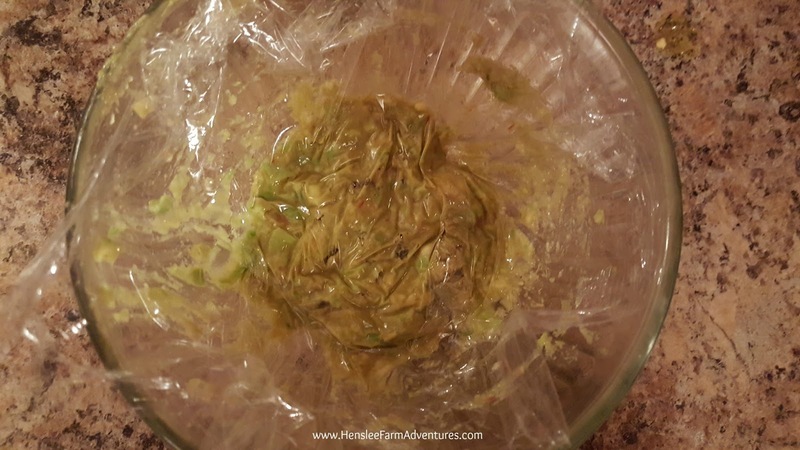 When you cover it with plastic wrap, be sure and put the plastic wrap directly on top of the guacamole. Doesn't look appetizing in this picture, but it works! So I hope that you give this recipe a try. 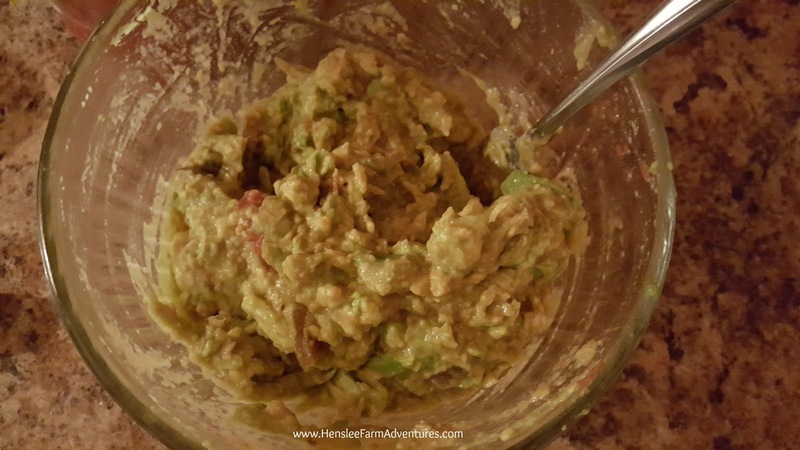 I love making guacamole like this, and knowing how easy it is, I will never buy those little packets of guac again.